Mechanical keyboards can be great, but for a while, it felt like they were all designed for millennial gamers. Many of these keyboards look like futuristic alien devices -- chock full of multi-colored RGB lighting and textured WASD key caps. There's nothing wrong with that if you are a young gamer in his/her bedroom, but what if you are an adult professional that just wants a mechanical keyboard for typing? An appropriate product is much more elusive. Last week, Razer launched a mechanical keyboard designed for productivity, although it could still be used for gaming, of course. Today, famed manufacturer CHERRY announces a new keyboard that focuses on work, rather than play. 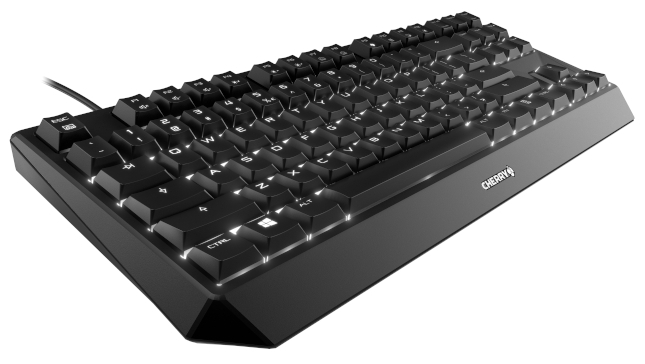 The "MX Board 1.0 TKL," as it is called, is both compact and affordable. Best of all, the tenkeyless keyboard features conservative dimmable white lighting -- nothing colorful or funky. "Even though the corded mechanical keyboard with TKL layout is designed for comfort, it’s as sturdy as the larger predecessors in CHERRY’s keyboard family. The MX Board 1.0 TKL is equipped with additional feet for a non-slip grip and adjustable for custom heights. Its anti-ghosting technology and N-key rollover function prevent input errors, while the Win-Key lock protects busy professionals from unnecessary headaches," says CHERRY. The maker also says, "MX Board 1.0 TKL has a space-conscious design, allowing comfortable and precise keystrokes. Each key is meant to last at least fifty million operations. The new keyboard is compatible with both PC and Mac and available in four signature CHERRY switch types -- red, blue, black, and brown. The product uses a plug and play connection that simplifies setup and configuration. CHERRY’s original MX Module, proven to be endure constant use millions of times over, guarantees longevity and makes MX Board 1.0 TKL ideal for continuous use." Chad Vendette, Director of Marketing at CHERRY Americas offers the following statement. The new keyboard would be a great addition for companies operating in small office spaces or for professionals on the move. Our research shows that the need for compact office equipment has never been higher than it is right now. We are responding to the market trends. CHERRY shares the following features of the new keyboard. Interested in purchasing your own CHERRY MX Board 1.0 TKL mechanical keyboard? It can be had immediately for the reasonable price of $99.99. Organizations can potentially save money by buying in bulk too -- the manufacturer will be selling special ten-packs.